The real Moroccan Oil: The history of Mogad'or Argan oil in a nutshell. The history of Mogad'or Argan oil in a nutshell. The Argan tree can only be found in southwest Morocco. Which makes Argan oil an extremely rare commodity. No wonder it’s sometimes called Liquid Gold. Traditionally the seeds of the Argan tree are collected by local Berber women, who then press them by hand to extract the precious oil. It can sometimes take up to 20 hours to produce just one litre of the oil. 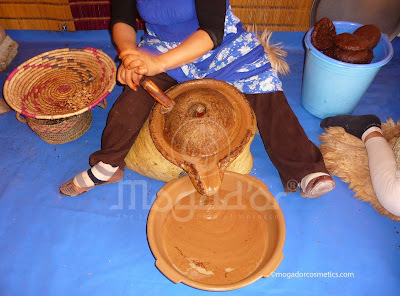 Nowadays making Argan oil is much easier. The kernels are picked straight from the tree and go through a cold press. This ensures none of the goodness of the oil is lost during the manufacturing process. Mogad'or Argan Oil stops the signs of ageing, naturally. Isn’t it comforting to know there’s a natural anti-ageing product that isn’t full of chemicals? Mogad'or Argan Oil contains squalene, phytosterols and phenolic compounds. Sound a bit bamboozling? All you need to know is that these natural ingredients help fight premature ageing. They keep your skin super soft and supple, protect collagen and fight off free radicals. Mogad'or Argan Oil, quite literally, rejuvenates your skin. And it can help reduce the signs of fine lines, wrinkles and age spots. Which keeps you looking younger. What’s not to love about that? Mogad'or Argan Oil shines when it comes to fabulous looking hair. Your hair is under constant attack. Chemical dyes, hair dryers, hair straighteners, UV rays, chlorine from swimming pools and environmental pollutants, all help to create dry, frizzy and brittle hair. Well, it’s time to transform your lackluster locks back into your crowning glory. Argan Oil is a natural cure for damaged, lifeless hair. It nourishes and moisturises each hair from root to tip, making your hair stronger, glossier, fuller and healthier. The oil is remarkably light, so it is easily absorbed without making your hair greasy. For miraculous results, massage a small amount into your hair. If you suffer from a dry scalp, make sure you massage the oil right into the roots. Wash Arganolie out with shampoo. For a more intensive conditioning treatment, keep the oil in overnight and wash your hair in the morning. You’ll be astonished at how shiny, soft and full of life your hair looks. Don’t blame us when you start hearing wolf whistles everywhere you go. Mogad'or Argan Oil works miracles on your face. Apply one or two drops of the oil to your face and massage it in gently. You’ll find the oil is easily absorbed and penetrates deeply into your skin. Now all you have to do is sit back and feel it work wonders. Pure Argan Oil can also be used to moisturise your lips, which means you can keep them wonderfully luscious and kissable. And did you know you could even use Mogad'or Argan Oil on your eyelashes? If they feel a bit dry, worry not. A tiny amount of Pure Argan Oil will have your eyelashes feeling all silky. You’ll be back to fluttering them in no time. Mogad'or Argan Oil. A natural healer and protector. Pure Argan Oil consists of 80% fatty acids and naturally high concentrations of Vitamin E, antioxidants and Omega 6. It also contains triterpenoids, which can reduce the effects of scarring. Our oil has anti-bacterial properties, acts as an anti-inflammatory and can protect the skin against pollution and sun damage. It can help clear acne and blemishes, as well as relieve symptoms of skin conditions such as eczema, rosacea and psoriasis. How cool is that for something made by Mother Nature? It’s time to tell your skin you love it with Mogad'or Argan Oil. Your skin is amazing. It’s waterproof and acts as an insulating shield against extremes of temperature, harsh chemicals, damaging sunlight and air pollution. When you think about it, your skin does a lot of hard work. Doesn’t it deserve a reward? Look no further than Mogad'or Argan Oil. You couldn’t be kinder to your skin if you tried. Our Moroccan Argan Oil is bursting with natural nutrients which keep your skin incredibly hydrated and in tip top condition. Mogad'or Argan Oil. The ultimate moisturiser for your body. Your body is in for a treat. For best results massage the oil gently into your skin after a bath or a shower. Remember the oil is so pure, it only takes a small amount to make a big difference. Frequent use of Pure Argan Oil will ensure you’re left with soft, smooth and irresistible feeling skin. It’ll feel so fantastic, you won’t be able to stop hugging yourself. Have you been overdoing it at the gym? If you’re suffering from tired, aching muscles, massage a small amount of the oil into them. Mogad'or Argan Oil’s anti-inflammatory qualities will help you go from sore muscles to soothed muscles. Mogad'or Argan Oil. Good for baby, good for you. Pure Argan Oil can be used when you’re pregnant. Which is fabulous news for all you expectant mothers out there. It’s wonderful for preventing stretchmarks and it can also improve your skin’s elasticity. And it’s not just phenominal for your body, it’s great for your baby’s skin too. It’s so gentle, it can be used by everyone in the family. Please note, if you suffer from a nut allergy, consult your doctor first before using. Mogad'or Argan Oil makes light work of your hands. Lots of us get dry skin on our hands. Argan Oil’s soothing and healing qualities can help, especially if you’re prone to skin problems. Massage in a little of Argan Oil and in no time you’ll get your beautiful, soft hands back. We think you’ll be so happy with your new hands, you’ll want to shake ours. There’s nothing more unsightly than dry, flaking nails which are prone to splitting. And wearing nail varnish can often make the problem worse. Thanks to Mogad'or Pure Argan Oil, help is at hand. Massage the oil into your nails and cuticles. It won’t be long before you notice softer cuticles and less brittle nails. Job done. Mogad'or Argan Oil won’t just make you look good. It’ll make you feel good too. We make sure our Argan Oil is responsibly sourced. Mogad'or Argan Oil is Ecocert Certified which means you always know you are buying the best quality oil. Unfortunately not all oils are as pure as ours. Some brands are often mixed with other ingredients which makes them less effective. We’ll always deliver you a product which is 100% pure and gives you 100% satisfaction. And here’s something else which will make you happy. With every bottle of Mogad'or Pure Argan Oil you purchase, some of your money goes to back into protecting the Argan forests. 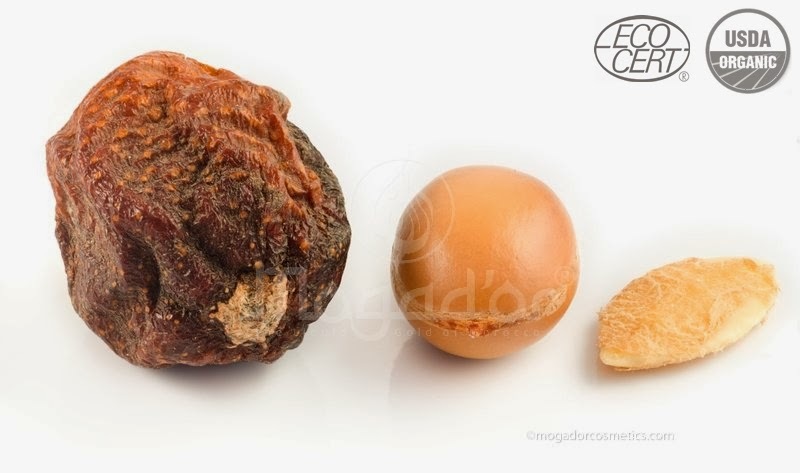 Argan oil is Mother Nature’s way of keeping you looking young and beautiful. Doesn’t it feel good that you can be kind back to Mother Nature? You can trust in Mogad'or Argan Oil. Your wellbeing is important to us. 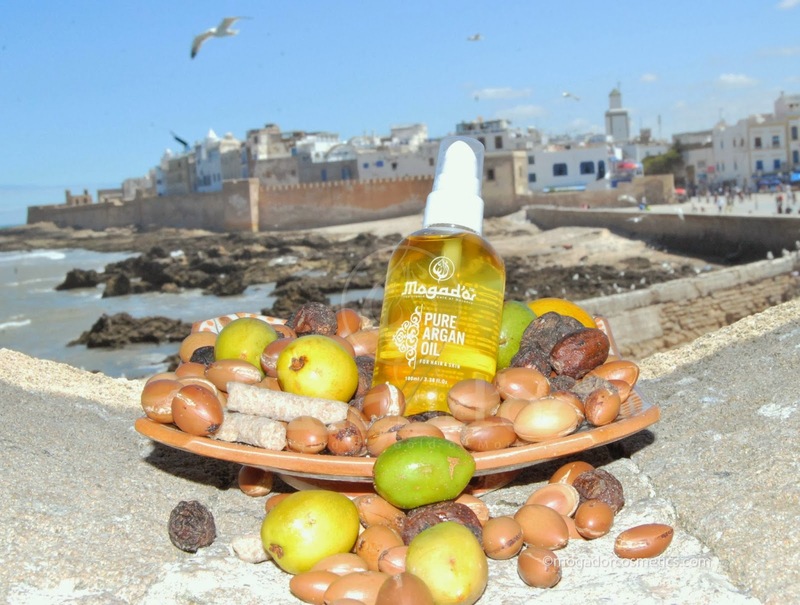 Mogad'or Pure Argan Oil is cold pressed, which means it retains all its nutrients. Because our oil is pure and perfect as it is, we haven’t added a thing to it. No perfumes. No colours. No preservatives. And no parabens, which have been linked to causing health problems. And here’s the best bit. Because our oil is 100% organic and natural, you know exactly what you’re putting onto your skin. In fact, Mogad'or Argan Oil is so pure, you could eat it. Bet you there are very few companies who that can say that about their moisturiser. A little Mogad'or Pure Argan Oil goes a long way. Mogad'or Argan Oil is 100% pure which means only a small amount is needed. Our luxurious oil is light gold in colour and super rich to the touch. But the beauty of it is that it sinks instantly into your skin, leaving no greasy marks. And your skin will feel so smooth and gorgeous, we guarantee you won’t be able to stop touching it. Put a spring back into your step with Mogad'or Pure Argan Oil. Feet have fewer oil glands than other parts of the body which can make them especially dry. Pure Argan Oil with its anti-inflammatory and anti bacterial properties can help to soothe them. And because Argan Oil is so deeply hydrating, it’ll keep your feet beautifully soft and smooth. There’ll be no stopping you from playing footsie under the table now. We hope you enjoy Mogad'or Pure Argan oil as much as we do.